Genesis Knuckles in Sonic the Hedgehog (any v1.1) in 13:05.29 by marzojr & WST. This is a hacked version of Sonic the Hedgehog. The title character is replaced by his rival, Knuckles. The levels remain unchanged. There is more than just an appearance change to this game. 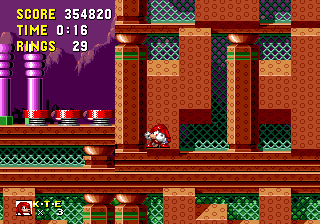 Knuckles' abilities remain intact. If you haven't seen Sonic the Hedgehog completed before, you may wish to do so before seeing what a character with a spindash and gliding can accomplish. There is also a run for a Tails hack of Sonic the Hedgehog, done by marzojr. It replaces Knuckles with Tails and gliding with flying. There is also the original run of Sonic the Hedgehog done by Aglar in record time without the advantage of spindash and gliding/flying. A camhacked encode is provided with every duplicate link. Note: An IPS patch for the hack can be downloaded here. It must be patched to REV 00.